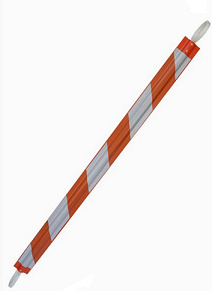 Orange/White reflective (High Intensity Prismatic) retractable temporary barricade rests atop two traffic cones using pair of 3 3/4-inch rings on each end. Adjusts quickly from 4-foot to 7-foot length with spring-button release. Rings on each end of panel hold panel atop cones. Compact and light weight 2 lbs. Three sizes: 4- to 7-foot; 6- to 11-foot; 8- to 14-foot.